Swimming in the ocean is a really difficult thing for a lot of people. As a triathlete, it is my least favorite sport to do and something I’ve struggled with for many years. Fear of death, discomfort in cold water, and nausea from rolling waves, it all adds up to a nightmare. Relax! Sure there are sea monsters that might eat you and you might actually get caught in seaweed and drowned, but you are far more likely to get run over by a truck crossing the street. Take a deep breathe and visualize calming thoughts and focus. Time you entry with the waves! If you can, time your entry just after a large wave. Waves come in cycles with a few smaller ones and one big one. If you wait until just after the big one to enter, you can clear the wave break before the next big one hits. Focus on your stroke! Feel the water move around your body, watch your arms move in front and below you. Make sure to rotate fully on each side. Reach wide for stability! I learned this from a swim clinic I took a while back, in rough water, instead of reaching your hand to the center of the body line, let the hand reach out from the shoulder. The wider stroke will help stabilize. Sight frequently! Especially if you are new to this. I tend to swim in circles, so I need to make sure I am heading in the right direction. Sighting frequently (every dozen strokes or so) allows me to correct. Roll to your back! If you need a break for a moment to refocus or catch your breathe, its okay, do it! Rolling to your back and taking a moment to regroup is much better than panicking and dropping out of the race. It’s okay to hit someone (accidentally)! 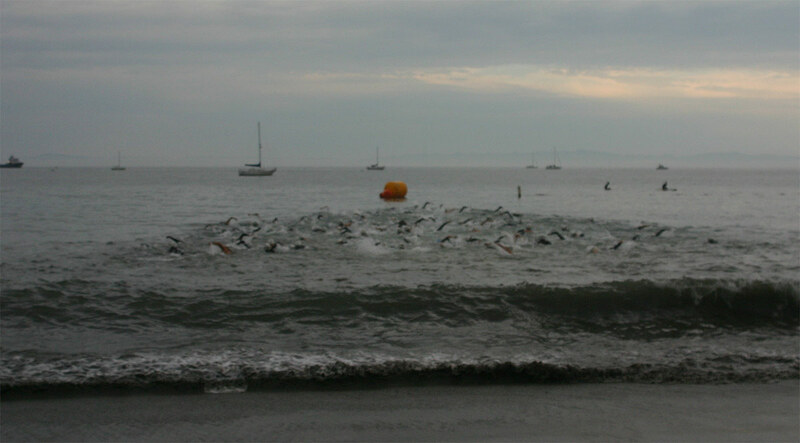 Swimming in a triathlon, particularly in a group can mean full contact. You will be punched and you will punch someone by mistake. Don’t panic, just refocus and keep going. Bi-lateral breathing is best! Breathing strictly to one side can be problematic if waves are crashing into your face, so learn to breathe on both sides so you can adjust. Bi-lateral breathing will also help you fully rotate and help you swim straighter. Swim as long as you can before standing up! Many people tend to stand up in water that is waist high or so when exiting the water. It is far more efficient to swim onto your belly, so get as close to shore as you can before standing up. With these tips you will be swimming better than ever in the ocean and you might actually look forward to it. Relaxing, focusing, and breathing will help you get through your next oceanic adventure! This entry was posted in milestones, Swimming, Tips, Triathlon, triathlon training, Uncategorized and tagged ocean swimming, Swimming, Tips, Triathlon, triathlon training. Bookmark the permalink.